When Brian Anderson first started transforming 5732 S. Lowe from a standard Englewood home into Shepherd’s Hope Food Pantry in September 2008, neighbor DeMarco Johnson warned him that others in the neighborhood thought the police were setting up surveillance to watch the many drug houses on the block and were threatening to blow up his lot. Inspired by Shepherd’s Hope, Johnson claimed he was going to paint his next-door home bright yellow to add to the brightness he thought the pantry would bring to his community. 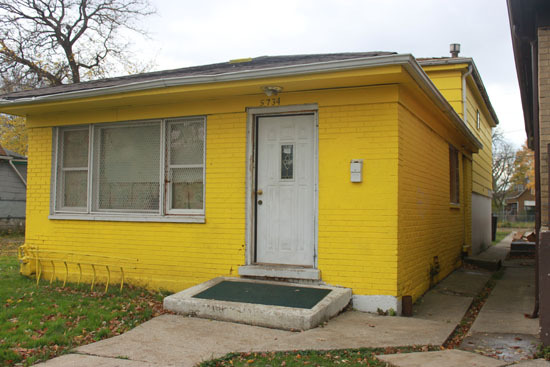 When Anderson returned four days later, the Johnson’s home was, in fact, bright yellow and still is to this day. Johnson's bright yellow house next door to Shepherd's Hope. Despite Johnson’s shockingly yellow home and the efforts of Shepherd’s Hope and many other hunger organizations, Englewood still faces the highest numbers of food insecurity in Illinois. A study released by the Greater Chicago Food Depository in September 2011 revealed that Englewood tied with North Lawndale for the highest food insecurity rate in Cook County at 31.2 percent. Defined by the USDA as “the condition that arises from a lack of enough income and other resources for food,” food insecurity spreads much further than Englewood alone. According to the study by the Food Depository, the food insecurity rate in Cook County is at 16.1 percent. This means that 845,910 members of Cook County — one in six people — are struggling to put food on the table. Since their official opening in March 2009, Shepherd’s Hope has seen a large increase in families utilizing the pantry. Over the past year, Shepherd’s Hope has seen a rise of about 100-200 people per month to well over 1,200 people per month, according to Assistant Supervisor Mary Lewis-Spraggins. “We’ve probably, in a year, gone from serving approximately 2,000 families last year to over 5,000 families that we’re serving now,” Anderson added. Although many of these people hold jobs and have a source of income, they do not make enough to keep up with rising living costs and they earn too much to qualify for any sort of assistance, according to the study. “There are a lot of people struggling to make ends meet—a lot of people that never needed to use a food pantry, soup kitchen or shelter before that are now turning to their local community organizations for help,” said Farno. Many individuals earn too much money to qualify for food stamps, yet continue to struggle to feed their families. 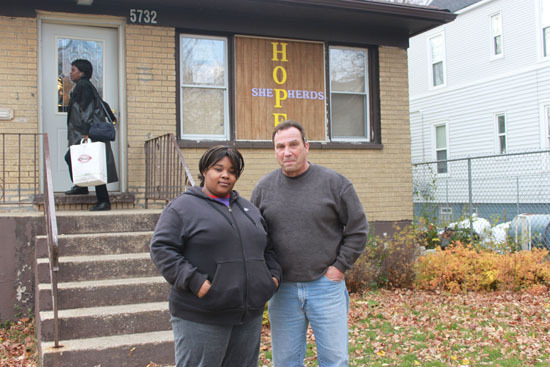 “Even people that do have food stamps—those that are fortunate enough to get that–they still come here [Shepherd’s Hope] because it’s just not enough,” said Shepherd’s Hope Volunteer Stephanie Sutton. Although food insecurity plagues millions of people across the globe, many feel ashamed to reach out to the various outlets offering food and resources to combat the problem. “Everybody is embarrassed, but sometimes you just need to put that behind you—you’ve got to get your next meal,” said Sutton. Sutton and Lewis-Spraggins are members of the Englewood community who work for the pantry and utilize its services along with people from all over Chicago, even outside of Cook County. Samantha Sutton and Brian Anderson outside of Shepherd's Hope. Shepherd’s Hope plans to continue community building by constructing a community center down the block to educate children and give them a safe place to hang out. To further their fight against food insecurity, the organization also bought 20 vacant lots on their street to start growing their own agriculture starting this Spring. Privately funded by donation from individuals and local businesses, Shepherd’s Hope receives its food from the Greater Chicago Food Depository and is open to the public on Tuesdays and Thursdays throughout the year.